SALE! Was $18, now $10! A classic fit long-sleeve tee from MV Sport. In 6.1 oz. pre-shrunk (99% cotton/1% spandex) cotton jersey with rib knit cuffs & collar. 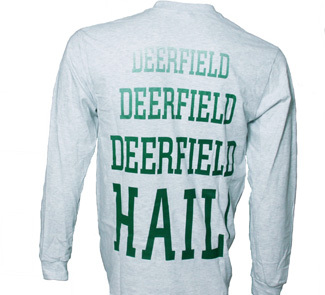 Heathered grey tee with the iconic phrase from The Deerfield Song screen-printed in green gradient ink full-centered on back. 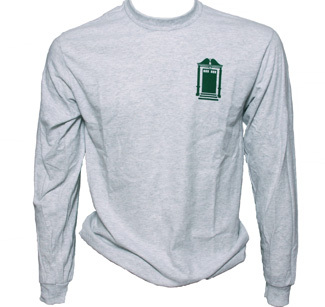 The Deerfield Door is screened in green on the front left chest. Unisex sizes S-XXL.